Lance at Great Lakes Brewing in 2013. Lance Rice likes beer. He is obsessed with the science behind brewing and its history, in fact. But until last year, he had never visited a brewery. Because Lance is on the autism spectrum, he struggles with social interaction, preferring instead to interact with science or technology while amassing vast amounts of knowledge in his brilliant mind. That’s how Lance’s Brewery Tour was hatched. His nephew, Aaron Rice, and a crew are taking Lance to dozens of destinations across the United States while directing a film about Lance’s journey and passion. 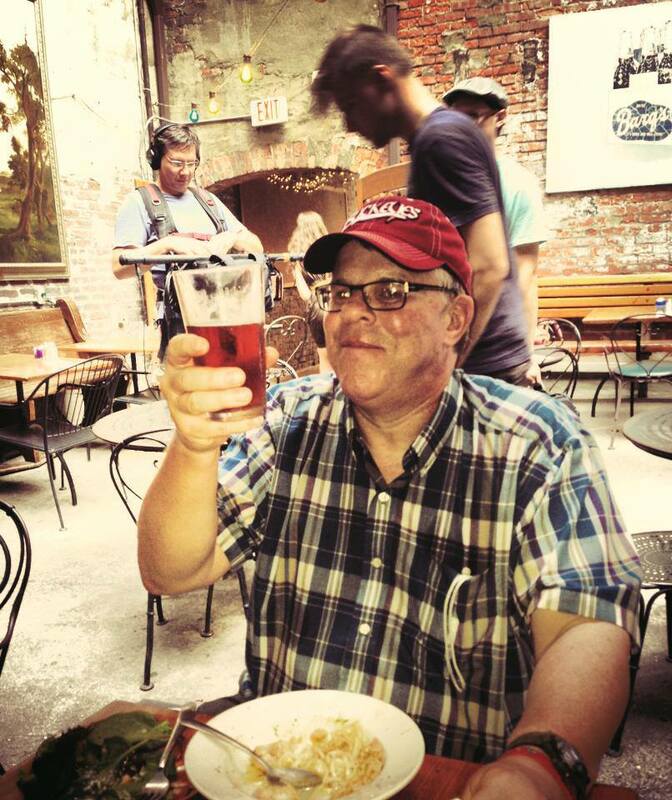 Meanwhile, Lance himself is writing a book that promises to be “a beautiful written and photographic encyclopedia of American beer culture past and present,” according to Lance’s website. The project is more than just a chronicle of Lance’s knowledge and his journey. The film and book will also help create a charity called Lance’s Room, dedicated to making similar dreams come true for those with autism. What so many don’t realize about people diagnosed as being on the autism spectrum – people like Lance – is that their communication difficulties and social awkwardness often belie deep sensitivities, passion and intelligence. That’s Lance. His parents noticed him having troubles with communication and socialization when he was just 4. Now in his 50s, Lance grew up in a time when autism was far less understood. He was institutionalized at one point. He became afraid to even leave his house and, unable to fit in, developed a number of phobias. But one thing always made Lance smile: beer. And as he grew into an adult in northeast Ohio, he began to develop communication and socialization skills most thought he never would possess. He now takes bike rides and walks alone and does volunteer work in his community. And, of course, he tours breweries. In fact, he has traveled tens of thousands of miles touring breweries. Earlier this month, he was in St. Louis. His long-time dream was not just to take this tour but to share his passion and knowledge in a book. It’s going to happen after nearly four decades of wishing. Alcohol Professor: When did you first start to become interested in beer? How old were you? Lance Rice: July 8, 1974. I saw an old Burger Beer can in the trash and I picked it up .My younger brother and his friends started collecting beer cans that summer and I liked looking at them, they were so interesting. I thought it would just be a summer hobby. AP: What is your favorite thing about brewing? LR: Drinking the beer. I also like that [beer is] a living organism. I’ve always had an interest in microbiology and the science of brewing. AP: What has been your favorite brewery so far and why? LR: I like them all. Each one has something different, interesting and special about it. Brewing people are the nicest people you’ll ever meet. AP: Are there any breweries you haven’t visited yet that you would like to visit? LR: Oh, I’d love to visit them all! There are so many fantastic breweries I haven’t been to yet. It never gets old. AP: What was it like when you went to your very first brewery? Which one was it? LR: My first one on this trip was Great Lakes in Cleveland. It was fantastic. They were so nice and showed me so much. The impressive list of breweries Lance has visited is online, but the tour includes stops in 18 states, from New York to California, as well as brew festivals, schools, hop farms and other special events. The journey is being chronicled as it happens in preparation for the book, the film and the charity foundation.